Brady Corporation's new B-348 Mass Transit Tag complies with minimal smoke and halogen emission requirements of the most strict underground norms for mass transit vehicles. 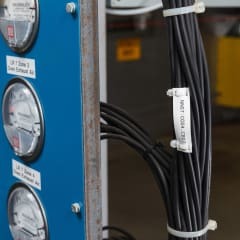 Printable both on-site and in the field, the tag is a practical solution for mass transit manufacturers to identify thick cables and cable bundles. Brady Corporation's B-348 Mass Transit Tag enables companies to identify thick cables and wire bundles using cable ties in buses and rail vehicles. The tag is available in white and yellow and comes in 4 sizes. It is a supplement to Brady's B-7641 Low Smoke Zero Halogen Sleeve that can be used to identify single cables before termination. Just like the B-7641 cable sleeve, the B-348 cable tag complies with the most stringent underground norms. The tag fully meets the low smoke and zero halogen emission requirements as described in EN-45545-2 'Requirements for fire behaviour of materials and components', including R-22 'interior' and R-23 'exterior' for Hazard Level 3. The Mass Transit Tag is also compliant with the British Standard BS6853. Large volumes of Mass Transit tags can be printed on-site in any facility using a benchtop printer model, while a Brady mobile printer can be used in the field to quickly label unidentified cables with the same tags. Printers compatible with the B-348 tag include mobile label printers like the BMP61 and the BMP71 Label Printer, and benchtop systems such as the BBP12, BBP33 and BradyPrinter i7100 Industrial Label Printer. Samples are available for testing via the Brady website.